In recent years, during one of the cycles of interest and uproar concerning Wonder Woman, Megan Fox said of the character that she was being considered to play, “She flies around in her invisible jet and her weaponry is a lasso that makes you tell the truth. I just don’t get it.” (OntheRedCarpet.com) Though much scuttle was made of this, in terms of disrespecting an icon, there is truth to the core of this idea. To properly embody a character as an actress, you need to have an access point of understanding of who that person is. The same can be said for a reader; that a connection to the character needs to be made. And though Wonder Woman is often beloved by a range of fellow feminists as an icon of admiration, I too found myself thinking, “I just don’t get it.” I was not a Wonder Woman reader. I had never picked up a single copy of the title. She was just a mélange of iconography from TV, lunchboxes, and feminist talking points. I realized that Wonder Woman and I could not have real connection, because we had never actually been properly introduced. 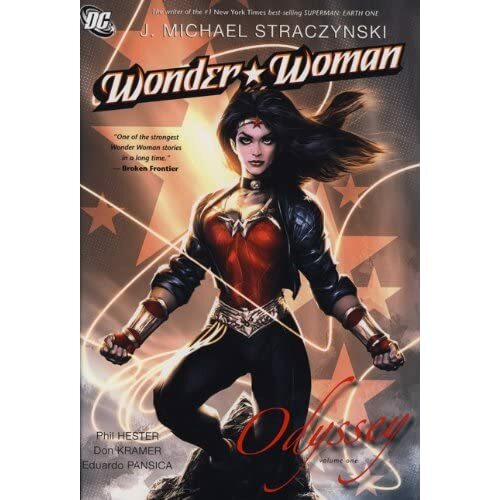 As part of my desire to have a more complete understanding of who Wonder Woman is, I picked up three recent iterations: Wonder Woman: Odyssey by J. Michael Straczynski (2010), Wonder Woman: The Hiketeia by Greg Rucka (2002), and Wonder Woman: The Circle by Gail Simone (2008). The first, and perhaps most complicated order of business to accept about Wonder Woman, is that she is a princess. A forerunner to contemporary animated characters such as Merida in Pixar’s Brave, she is a royalty that not only seems to always have wonderful hair, but also a flair for being able to take care of herself and often the rest of the surrounding society. She is in fact so separate and different from other royalty that she was not born of a regular relationship between a king and queen, but rather birthed from clay by the will of her mother, and a bestowment from the gods. This history is covered in both the stories of Straczynski and Simone, which retell Wonder Woman’s origin myth. She is not a historical Disney princess waiting on a prince, nor even a contemporary one. She is much more powerful than that, though she may not always recognize it. However being a princess means that you have obligations to your people, and Wonder Woman is, at the end of the day, an Amazonian. Different authors have taken varied tacks on why Wonder Woman is in the United States rather than in her homeland of Themyscira. In Wonder Woman: Odyssey her mother is killed and she is sent to away for her own protection. No matter why she has left her home, there always part of Wonder Woman that is an outsider, which seems to be a reoccurring subplot and leads to discontent. Being an Amazonian by heart and a U.S. resident by location only, she has a higher Hellenistic code that she must abide by. Wonder Woman’s powers focus on truth and forgiveness. Perhaps she finds her origin not truly in Greek thought, but more in the mid twentieth century hybrid feminist philosophy of her creator William Moulton Marston. He is quoted as saying. “Not even girls want to be girls so long as our feminine archetype lacks force, strength, and power. Not wanting to be girls, they don’t want to be tender, submissive, peace-loving as good women are. Women’s strong qualities have become despised because of their weakness. The obvious remedy is to create a feminine character with all the strength of Superman plus all the allure of a good and beautiful woman.” (Wikipedia: Wonder Woman) Unfortunately this code of ethics often seems to be invoked at will and as a plot device. In Simone’s story, Wonder Woman actively kills a large group of contemporary Nazis (an ode to her early incarnation in WWII era publication), but then when is confronted with woman who threatens to kill her mother, she offers forgiveness not death. Perhaps all the lives of Nazis are so despicable that they are equal in weight to the value of one traitorous Amazonian. However the sum of these concepts do not a knowable character make. After reading all three turns at Wonder Woman, I still feel more like Megan Fox than an acquaintance, follower or fan of Wonder Woman. In all of the stories, the primary action and fight sequences are tied in some loose way to her history as an Amazon. Surely there are not that many Amazonian based large-scale entanglements to be had in contemporary society. If that is true, what does she spend the rest of her time doing? Only in Rucka’s book do we get a real sense of the potential of Wonder Woman in regular contemporary society, where she has taken on an assistant due to Hellenistic moral obligation. She has her assistant help her on a day that includes meetings at the U.N., taping P.S.A’s in the afternoon, and then an educational lecture about non-violence. Simone has Wonder Woman in her more traditional alternate identity of Diana Prince, a government agent. Unfortunately this embodiment feels more like a plot device to introduce her love interest, which is also her work partner. Why is Wonder Women, if she is still to be considered a role model and feminist icon, seemingly constantly driven by her past and not her own ideas or decisions that she is making for her future? In Straczynski’s retelling of her story, we find her as a late teen with only a meek understanding of her potential, coming to terms with who she might be. Her character seems to be coming to terms with powers and actions that are fated and not achieved or gained by work. In a world where you are a princess, perhaps it is hard to know if there is any possibility of success through merit at all. Currently I feel a much greater kinship with a different royal, Kate Middleton, than Wonder Woman. Kate at least shares clothes with her mom, waited ten years before marrying her partner and seems genuinely nervous at speaking engagements. Even the campy 1970’s television version of the character seems to be more self-assured than her comic counterparts. In the first episode, Wonder Woman: Pilot: The New Original Wonder Woman, viewers see Diana making decisions to deceive her mother to earn her place as Wonder Woman through a dramatic game of skill called “Bullets and Bracelets”. Her choices, her life, her achievement. If Wonder Woman is to endure as a character and not just an empty icon, she has to have more depth. Straczynski, Rucka and Simone are all established writers with substantial and smart work under their belt, and thus I worry that this may be a hard pressed goal no matter who the is the writer of the day. There are many ways to approach this goal of realness: more focus on her day to day life, a real and meaningful investigation of what it means to be a female as part of the Justice League (not just their secretary), or even a little soul searching on what forgiveness means and why it is important. Perhaps even framing Wonder Woman’s story as the story of a first generation immigrant. After all, she is a woman who is sent for to a new land, having deep emotional and moral ties to a homeland that she might not even be able to access any longer and tries to live her life with dignity, grace, and empathy towards those in her new home. Those are the real stories of women that I know. Shortly after Wonder Woman was created she fought Nazi’s because they culturally relevant issue. She can no longer fight Nazi’s, but needs to fight the issues that are relevant contemporary women, contemporary society. She needs to be a woman that happens to be born from the gods, not a god that happens to be a woman. This entry was posted in Columns and tagged Diana Prince, gail simone, Greg Rucka, J. Michael Straczynski, Megan Fox, Wonder Woman. Bookmark the permalink. Follow any comments here with the RSS feed for this post. Post a comment or leave a trackback: Trackback URL.